One of the more stressful tasks when you are putting together a video is finding the right content to enhance it. Music is a primary example of this, and you can drive yourself crazy trying to come up with the perfect sound to accompany your clip. The longer the video, the more music you need, and the more stress that builds. While the search is hard enough, it is the cost that can really kill you. Just buying the rights to high quality music can be impossible to maintain on a limited budget. If you are an amateur, you might have no budget at all. Don’t worry, free resources for music actually exist. Here are some great ones where you can find both music and other sounds that are offered for use by their creators, royalty free. Be sure to check the specific limitations placed on each file before use. Part of Wikipedia’s network of sites, Commons has different forms of media, including audio, video and images. The audio portion is made up of different clips, from historical speeches in the public domain, to snippets of music or full songs put their by their creators. They also have sound effects, examples of sounds found in nature, and more. It takes a bit more digging, due to the magnitude (and sometimes poor organization) of the site. But you can find some real gems amongst the files. Vimeo has become rather well known for their platform, which has been adopted more and more by artists and filmmakers that want a non-corporate entity to host their work. Unlike YouTube, which gives preference to big earners, Vimeo is all about the creative work itself. Not everything in their music store is free, but a great deal of it is. What isn’t tends to be offered for very cheap, as little as $0.99. They have all different genres, such as folk, rock, meta, new age, experimental, sound track and anything else you can think of. You can also create your own custom tracks. An archive of many different items on the internet, including host to the Way Back Machine, Archive.org is usually associated with ebooks, audiobooks (read by volunteers), and podcasts. But they have a music section full of public domain and creative commons works that are worth looking at. One of the best ways to use this resource is for finding very old work that can be used now, or finding artists who often release their work for free use, to contact one on one. They also have access to a number of projects you should look at. 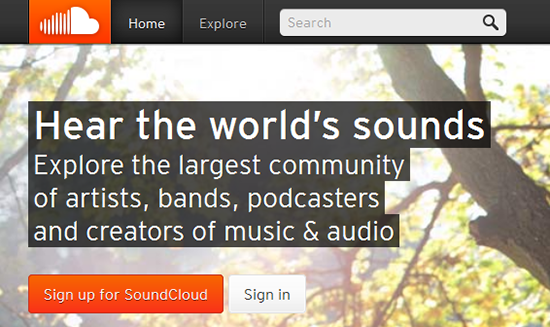 Best friend to independent artists and bands looking to get their work out there, Soundcloud is another amazing way to connect with bands and artists who are often willing to have their work featured for free (with credit) on videos. Often this is hosted right on the site, though you can always ask the artist for a wider view of their library off of the site. Still rather new and in beta, FMA is still quickly becoming a favorite place for video makers looking for fresh and high quality music. You can search by curator or genre, and also check out their featured music that changes regularly. Their front page has great introductions to hot artists who have been making waves across the web. They also have a wide array of categories, everything from folk, to blues, and even historic or old fashioned music. It wasn’t too long ago that YouTube opened up their own library of music. 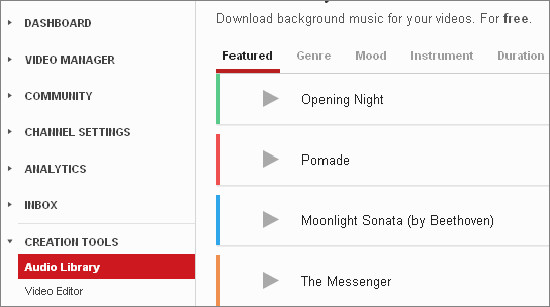 You can search by featured, genre, mood, instrument, duration, and save favorite. Or do a keyword search if you prefer. Everything is free, so just do a download, then use it as you need it. They have plenty of recognizable songs, such as classical standards by great composers. Because it is still new, the library is growing. It might not be the best place to find music yet, but it is getting better. Do you know of a good site for finding music resources for videos? Let us know in the comments. Music make low tress ..Here is Video Marketing resources..
hello LOVE your tools site! I used your broken links module and found lets say 1000 broken links I then went to google webmaster removal tools and to date have entered 1705 of them to be removed The status says they are gone but your site still shows them as active…..What I have done wrong here ? Finding audio and images can be a pain. I’ve pretty much abandoned audio and image sites that claim to be “free”. Oftentimes, the “free” turns out to be too much of a hindrance because of the TOS. There are plenty of sites that will fit into anyone’s budget and still meet your needs…but you have to search for them. I’m not saying don’t ever use the “free” sites… I’m just saying make sure you read the Terms of Service to make sure what you can use it for. Some really good info here which will certainly come in useful as I continue my online marketing career. Vimeo looks really good. Will certainly check it out.